The popular NNUH Dementia Information and Advice Fayre will be returning to the East Atrium this spring. The hospital is assembling a wealth of experts and agencies for the event, which will take place in the East Atrium on Monday 13 May 2019 from 10am to 4.30pm. The Dementia Information and Advice Fayre goes from strength to strength every year with a host of speakers, information stands and pop-up café. 12pm – 1pm – ‘How about the carers? Supporting family carers in dementia’ – Eneida Mioshi, Professor of Dementia Care at the Faculty of Medicine and Health Sciences UEA. The event is traditionally held on the week before dementia awareness week, which this year runs between 20th and 26th May. 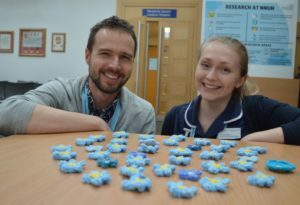 For this year’s event we are calling on people to knit or crochet forget-me-not flowers, which will form a new piece of artwork for the fayre on 13 May.